Have you seen the video on wealth inequality that went viral this week? The video is based on a study by Harvard Business professor Michael Norton. If you haven’t seen it yet, check it out here. Millions have been passing it around and dropping their jaws when they see the dramatic difference between the average person’s perception vs. the reality of wealth distribution in the United States. The dramatic spike in inequality and decrease in social mobility in the United States runs contrary to everything we are told to be proud of in a country that is supposed to hold opportunity for those who work hard — the American Dream. Our country also has a unique tradition of charitable giving and volunteerism, something we cultivate and take pride in. Yet, as income inequality dramatically grows, all these great traditions that built opportunity in the United States are being undermined. Neighborhoods in the United States are rarely integrated across income levels, and churches typically draw their base of support from the nearby area. When wealth inequality was not so dramatic, churches and church organizations could circulate a larger percentage of the nation’s wealth. Church funds have traditionally helped bridge gaps for families in need so they would not slip into poverty, and churches were the first in the United States to create anti-poverty ministries such as food pantries and homeless shelters. Today, the bottom 80 percent of income earners bringing in their envelopes and putting money in collection plates circulate a total of LESS THAN 50 percent of the nation’s entire wealth. This means that unless they have members in the top 20% of the wealth bracket or they win generous foundation grants, most churches have a severely limited amount of wealth to work with. Sometimes people argue that if we cut federal government spending on the social safety net programs that alleviate hunger or offer shelter, churches will pick up the slack. This kind of thinking comes from an era when wealth inequality was not so dramatic. The way our country is structured now, a government made by and for the people is an essential partner to fill that role. A Bread for the World study found that if the federal government cut nutrition aid as dramatically as the 2011 Budget passed by the U.S. House of Representatives, each congregation in the United States would have to raise an additional $50,000 to meet the hunger needs in the community. 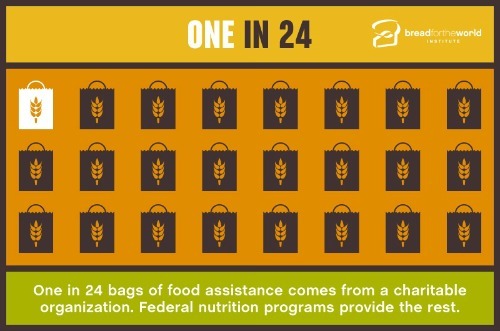 In fact one in every 24 bags of food aid comes from charity. The rest comes from government. We do have a someone we can look to who has considered questions of scarcity and abundance, poverty and inequality in his ministry: Our God incarnate. Jesus’ miracle of loaves and fishes is interpreted by some to not have been made possible by a magic zap from heaven, but rather by a compelling appeal from Jesus to his followers about the importance of sharing for the good of the greater community. When the miracle of the loaves and fishes happened, food that was once hidden and inaccessible was shared. The hidden abundance was discovered. This is an important story. It appears in all four gospels (Matthew 14:13-21; Mark 6:30-44; Luke 9:10-17; John 6:1-15). In the story, as in many modern Christians’ lives, Jesus draws out each person’s best self by orienting them toward loving and serving one another. He supports a sense of community and concern for the common good. Today, such sharing would indeed take a miracle. In our budget and deficit negotiations in the United States, God can use us to make this kind of sharing of wealth happen again. We need a balanced approach to deficit reduction, and from those to whom much has been given, much will be required (Luke 12:48). Those in our nation who have most benefited from our economy can share the hidden wealth so all can realize abundance. Weigh in: What role do you think the Church should play in ensuring there is enough for all? Comment below or post to our Facebook page.